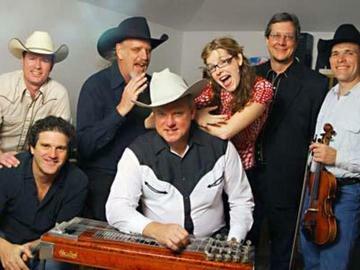 Six time Grammy Winner, Asleep at the Wheel, the famed western-swing, boogie, and roots-music outfit is still on the upswing RETURNS to Sengelmann Hall. The group’s been around for nearly 40 years, turning out an incredible 25+ albums while playing an unrelenting schedule of one-nighters that would make a vaudevillian dizzy. “In terms of how many people we played for, what we accomplished, and how much money we made – well, we didn’t make any money – this year was absolutely our best year ever,” says Wheel founder and front man Ray Benson with a chuckle. The Wheel’s new look is also spotlighted in several new discs – the first called, appropriately enough, Reinventing the Wheel. The 12-cut celebration of American – particularly Southwestern – music features guest appearances by gospel’s Blind Boys of Alabama (with a splendid reworking of the old Wills tune “The Devil Ain’t Lazy”) and banjoist Rolf Sieker, along with lead vocals by McQueen and Roberts as well as Benson, whose voice has been synonymous with Asleep at the Wheel for decades. The second is 2009’s Willie and the Wheel; a collaboration with Willie Nelson that was originally envisioned by famed producer Jerry Wexler in the 1970s. Unfortunately before they had a chance to cut it, Nelson had left Atlantic Records. But over the ensuing decades Wexler kept the idea alive and even gave Ray his entire collection of western swing vinyl that included his notes on song choices and treatments. In late 2007 the idea was revived and Jerry and Ray reconnected by phone. Always the producer with a vision, Jerry was involved in every way. He insisted that some of the tracks should include horns as well as a return to traditional fiddles and lap steel guitar associated with western swing. As the sessions concluded and Willie finished his vocals the tracks were sent to Jerry. “To my delight and relief,” says Ray, “he loved them.” In fact, Wexler heard most of the finished tracks prior to his passing in August 2008. "Jerry wanted us to do this album and I'm glad we got to do it for him, “says Willie Nelson. “And that he heard it before he passed on." The success of the Willie and the Wheel album release was quickly followed up by a tour and even a taping of the 35th anniversary of Austin City Limits for PBS (for broadcast in Fall of 2009), a fitting double-bill as Willie had taped the pilot and Asleep at the Wheel appeared in the very first regular episode of the legendary live music television program. KIDS UNDER 12 ARE FREE - BUT YOU MUST CALL 979-743-2300 TO RESERVE SPACE AT SHOW DUE TO CAPACITY LIMITS. IF NOT, WE CANNOT GUARANTEE ENTRY TO DANCE HALL!